With so many websites vying for our attention, it’s harder than ever before for business owners and marketers to ensure customers are not only clicking on your website but staying on it long enough to convert. If your website isn’t delivering a great user experience (UX), your customers will simply move onto the next one. While UX can mean different things to different people depending on the industry, one factor it has in common for everyone is site speed. We have three seconds or less to capture someone’s attention online and, if your website takes longer than that to load, you’ve already missed your chance. This will ultimately negatively impact your marketing efforts as, once Google sees the site bounces, your rankings will take a hit. So, how do you improve your site speed and, in turn, ensure all your SEO efforts – not to mention your social media and Google Ads that link back to your website – aren’t going to waste? Here are five simple ways you can optimise your site speed today. HTML is the backbone of almost every website, allowing you to format pages, text and images. But if there are too many unnecessary characters or it’s not organised properly, it can impact your site speed. Start cleaning up your HTML by removing all the unnecessary character spaces and line breaks. While it might make the code easier for you to read, it’s simply more to load. We also recommend that you place your CSS links at the top of your HTML document. 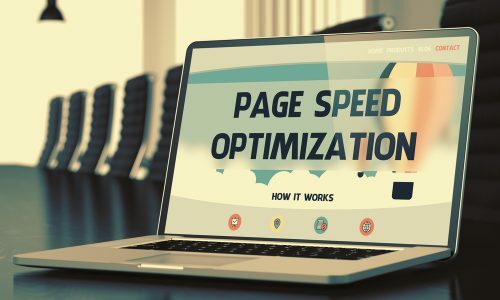 Not only will this improve loading speeds, it also ensures your visitors don’t wait on blank screens or see a flash of unstyled text before the page has finished loading. Images play an important role on websites. They break up giant walls of text, they’re eye-catching and they help your potential customers create an emotional connection with the products or services you offer. And this ultimately influences purchase intent. While you should always have high-quality images, it’s critical for site speed that they are optimised at the size you want them to be displayed at. For example, if you have an image that’s 1500x1500px, but you’re only displaying it at 150x150px, it’s currently taking ten times longer to load than it needs to, impacting your site’s overall load time. When building a website, it’s easy to become carried away with all the new and exciting features available, thanks to today’s technological advancements. Gone are the days of static text-filled webpages; instead everything is dynamic, visual and interesting. But what’s also gone is your customer’s patience, and no matter how interesting your site is, if it takes too long to load, you visitor will move on. By simplifying your design, you’ll not only improve your user experience (and increase the likelihood of conversions), you’ll also improve your SEO rankings. This is because Google can’t read a lot of the scripts used to implement fancy features. Why spend all that time writing content with relevant keywords if Google can’t understand you? Caching allows your site visitors to store elements of your website on their hard drives in their cache or temporary storage. This means when they next visit your website, their browser can load the page without sending all those HTTP requests. These days, customers tend to make a couple of visits to a website before making a decision about a product or service. By enabling caching, you’re making your website a more likely candidate for your customer’s decision. If you’ve tried everything else and your site is still loading slowly, it may be time to review all the files you have saved on your website. Are you offering whitepapers, eBooks or other files for your customers to download? If these items are too large, it could reduce your site’s overall speed. To avoid this problem, we recommend compressing files to reduce their size before having them available for download. Lastly, we recommend speaking with your web developer who may be able to suggest additional steps you can take to increase your website speed and ensure your marketing efforts aren’t going to waste. If you don’t have a web developer or you would like to speak to an expert, get in touch with one of our online solutions advisors today. Not only do we have the skills and expertise to improve your website’s loading time, we can also help with your marketing efforts once you’re up to speed.